The healer kept as still as possible during the experiment. 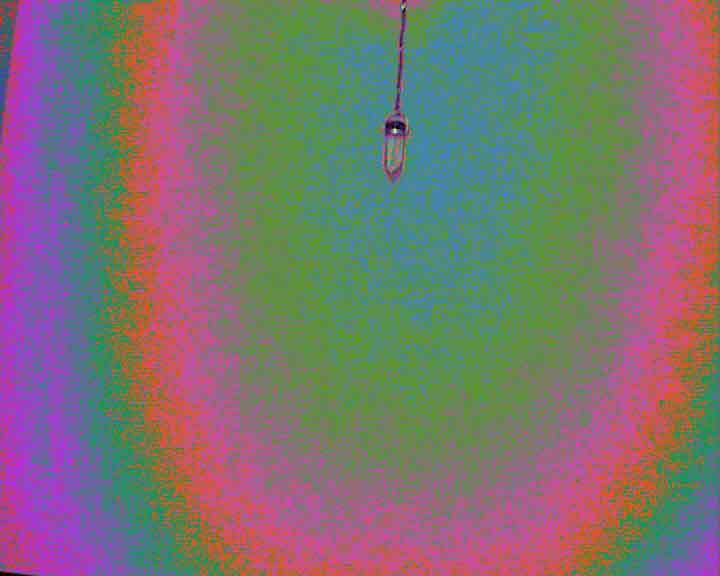 The lighting was full-spectrum tube on ceiling. All extraneous light was blocked out with a ‘black-out blind at the window. The video camera was kept in same position on a tripod and was left recording during the experiment. No one else was in the room. Filter 001 used. The crystal above has not yet been ‘energised‘ by the healer. 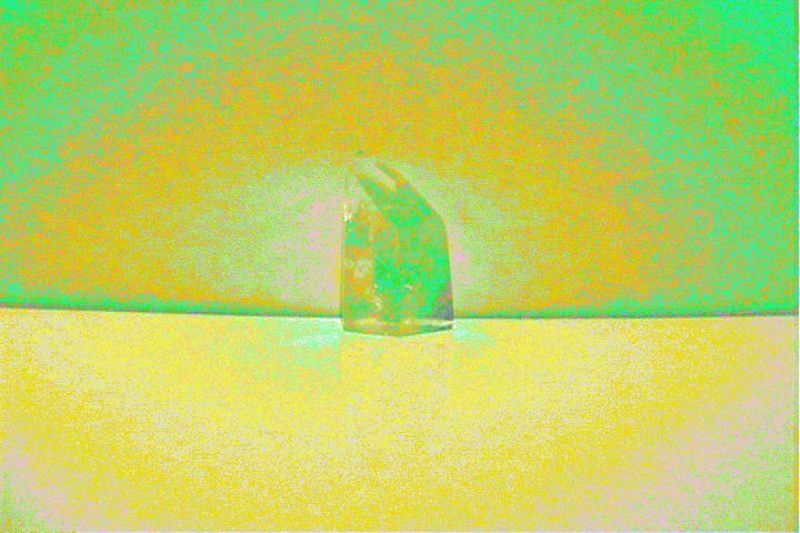 Although some light is visible within the crystal it is generally dull. This is the same crystal after it has been energised for healing. Here the crystal appears more vibrant, bright, and light-filled than in its pre-energised state. 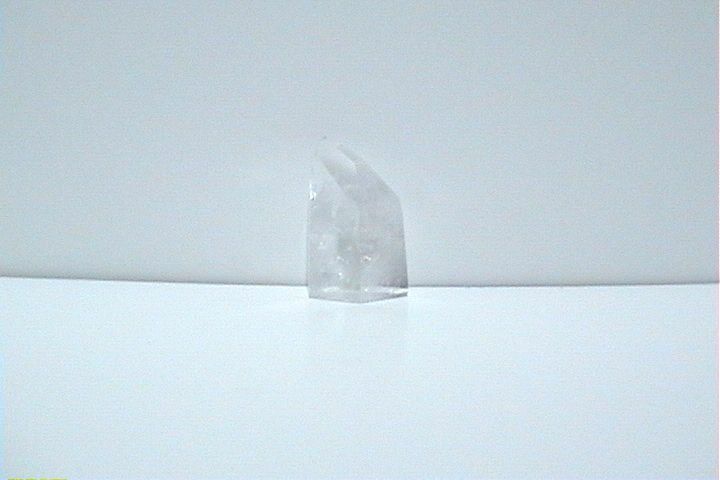 Image of the clear quartz crystal at start of the experiment, during which a group of twenty people sent positive thoughts to the crystal which was fixed to a piece of card and placed centrally in front of the group. Halfway through the session the light on, and around, the crystal can be seen to change. An orange glow appears.The light field around the crystal seems to have expanded. 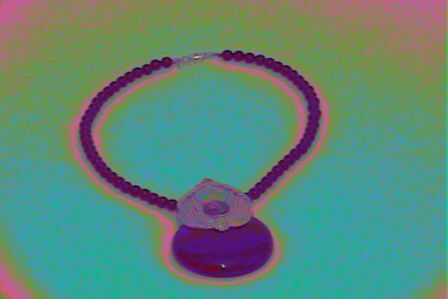 Healers often sense changes in a crystal when it is energised or used for healing. 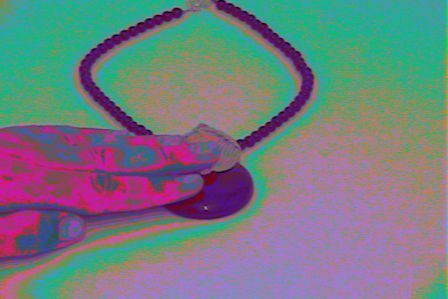 The pictures above show changes in the light, or energy, in a clear quartz crystal after just 2 minutes in the healer's hand. Changes seen after 2 minutes - quartz in palm is getting brighter; light above healer's hand/quartz is now a much higher frequency white; healer's hand is becoming more green (suggests more balance); both quartz crystals on table are a higher frequency yellow and less green. The crystal is on a plain surface with a plain matt background so that the light of the crystal can be seen clearly be seen when the BFR filter is applied. If you were going to energise this crystal and wanted to see changes 'before' and 'after' energising make sure that you place the crystal back in the same place after energising and, that the camera position and lighting are the same for 'before' and 'after' photos. Different frequencies of light and shapes of biofield around crystal can be seen. 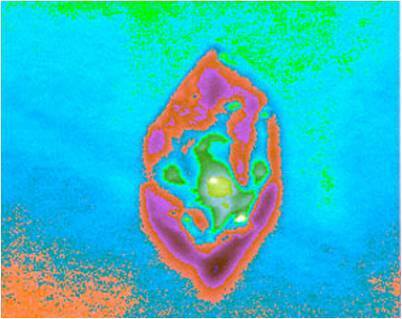 Higher frequencies of pink and pale green seen in field around the crystal which also has a golden glow. Highest intensity of light – white, seen with pale blue where crystal rests on table. Vibrant yellow on table mirrors the vibrant gold seen on wall above crystal. 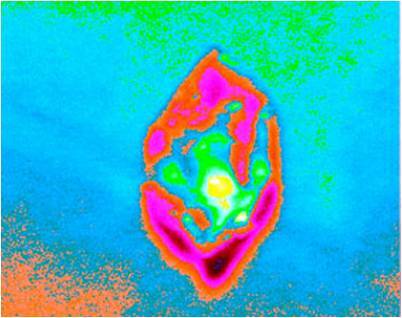 Lots of green (balance) light seen within the crystal. The control shot (above left) shows someone with congestion – seen as red light – in their fingers. They suffer with intermittent stiffness and pain of their thumb and first two fingers. Obsidian is believed to help with complaints of the joints. In the control shot of the pendant (above middle) we can see a blue field around most of the pendant. The picture (above right) was taken soon after the person made contact with the obsidian pendant. 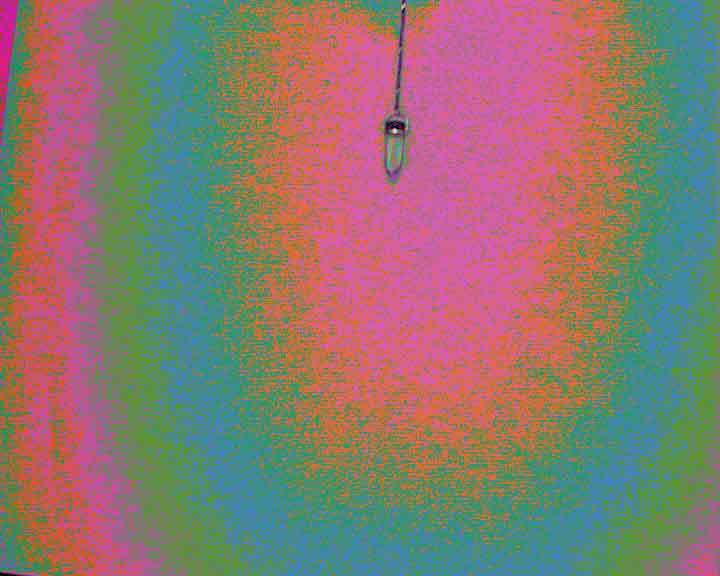 After contact there is a discernible change in the light around the pendant and on the fingers. The fingers show more congested red light. Some sensitives describe seeing a ‘drawing off’ of negative energy when obsidian is used. Perhaps we are seeing this effect, i.e. 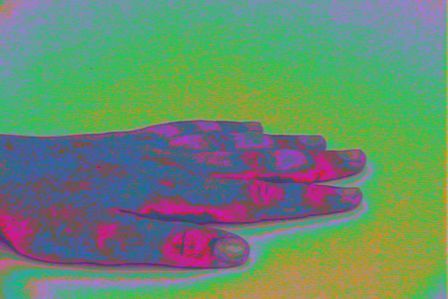 red energy is being drawn away from the fingers? 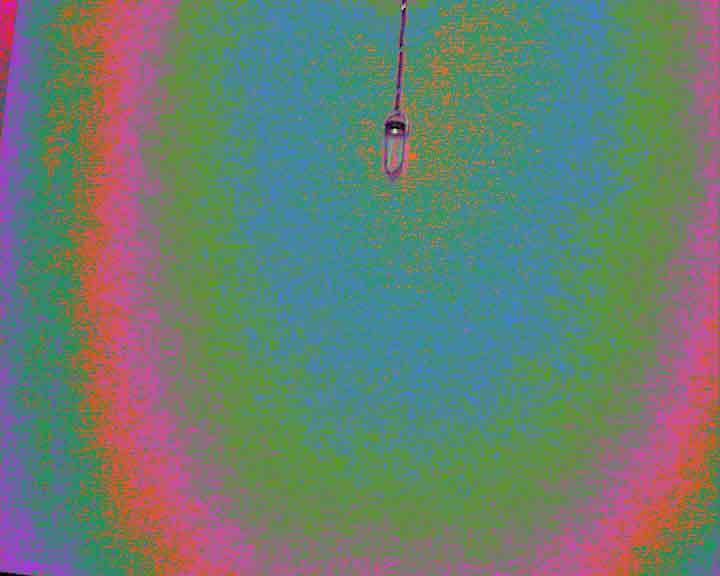 The intensity of the light has also lowered around the pendant and red can be seen replacing the more vibrant blue seen in the control shot. Perhaps this could be ‘fall-out’ from the red energy from the fingers?